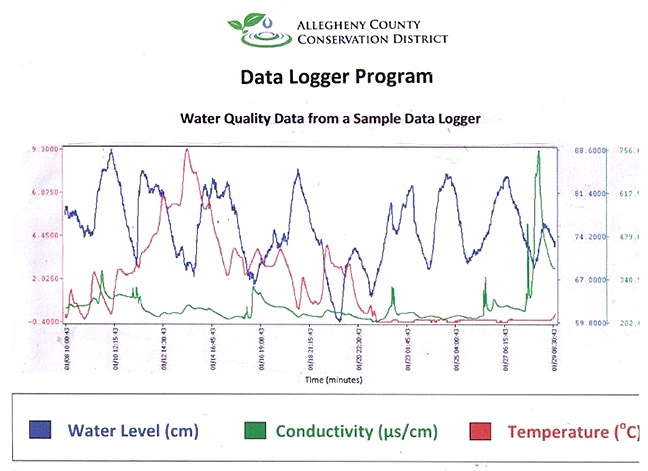 Allegheny County Conservation District has provided data loggers to four watershed group partners, including Little Sewickley Creek Watershed Association, to record conductivity, temperature and water level. A data logger is an electronic device that is set in the creek and records water chemistry parameters. ACCD uses the Solinst Levelogger Jr. This model allows continuous monitoring of creek waters 24 hours a day, 7 days a week. There are two loggers on Little Sewickley Creek. This data is important because pollution from non-point sources* is the number one cause of water quality impairment in Pennsylvania. The main goal of this project is to develop an early warning system for watersheds in Allegheny County to protect stream waters from the many causes of non-point source pollution. This early warning system can detect spills, leaks, accidents or extreme weather events that would result in non-point source contamination. Also, having a time-series history of a pollution event could assist in determining the location and timing of the problem, thereby helping to establish the source of the pollution. The Little Sewickley Creek Watershed Association has been collecting other chemical data and velocity statistics on the creek for over 30 years from recording devices. First, with Ed Schroth’s Up the Creek high school students from 1978-1999. More recently, the QV Creeker high school interns have incorporated the data loggers into their regular regimen of chemical and biological data on the creek and its tributaries. A non-point pollution generally results from land run-off, precipitation, atmospheric deposits, drainage, seepage or hydrologic modifications where there is no discernible pipe, ditch, container or conduit to identify the pollution source.